As a small child I was drawn through books in my parents’ library to Hinduism, Buddhism and Christianity, in various forms which stressed direct understanding or “experience” of Truth or God. Through reading on such subjects, as well as a few discussions. I think I had heard of Ramana without ever reading words which came through Him, seeing pictures of his body, or reading stories about Him. When I was in my teens the names of other “gurus” from India were much better known. You can probably think of at least a couple of such names, especially if you were born before the 1980s. In my teens I was first drawn to the ‘Tao Te Ching’ and ‘Chuang Tzu’ and then just before my eighteenth birthday to the Vedas with their crown, The Upanishads. By my eighteenth birthday this was my background as well as sporadically practiced meditation with my self-chosen mantra “Rama”. The use of mantra meditation was inspired to my by the, at the time, still fairly popular Transcendental Meditation, which was all I knew of meditation. Around my eighteenth birthday. I was searching through books on Eastern Religion and Meditation and the bookstore at the local mall, when I finally found a book which seemed useful and to speak with authority. The book, which explicitly stated that thoughts are the cause of Ignorance, would have a profound effect on my life despite that I would later come to see its author as a charlatan. The author was famous (or infamous) but I had never heard of him. Several methods of meditation were expounded upon however the one that had a surprising effect on me was fashioned after Atisha’s ‘Seven Points of Mind Training’. The underlying concept for the mediation seemed to be a simple axiom: The mind is the cause of Ignorance. To “experience”, or rather consciously be, Truth the mind must be made silent while remaining awake. After meditating for three hours per day for several months, I experienced a great increase in the depth meditation. The “progress” felt very nice until I had a couple “experiences” which were perfectly profound, while being both very familiar and shockingly unlike any expectations that my mind had created. At those times, there was only meditation. Sometimes when thinking about this perspective, trying to interpret it through the mind, I would be sad. I felt like a baby who was removed from the womb to soon, because I was attached to desires and memories about a world which I now had seen to be the stuff of dreams. Around the same time, I also found my new “guru”, who I felt was my guide and who now lived in the same state of the US as me, was a fraud. I pulled back from “spirituality”. I felt like the “world” and “myself” were as dreams and with the slightest provocation I could wake up and be disloyal to my desires and attachments. I felt like the man in a story by Tagore who after a long search had stumbled upon the house where God lived, then took off his shoes to silently run away. Strangely, I wished I thought the world and myself were real like I had thought not long before. Besides an introduction to meditation, there was another gift in finding the book by the man who was a spiritual fraud: He sometimes referred to Sri Ramana Maharshi. This name appeared among a list of four five other people said to be enlightened masters of recent history. I took all of the names seriously at first. Now only the name “Sri Ramana Maharshi” is relevant. For years, I only found the same few works in the library and less often in the bookstore. One work, “Who Am I?”, I have read at very least several tens of times over the years. It was the first work I ever read and the the one I have re-visited the most often. Bhagavan’s words are often subtle, but with time they penetrate deeply. Unlike the charismatic “guru” I was originally drawn to, Bhagavan was not flashy or provocative. In fact, He conducted Himself like what I had imagined my original “guru” to do. Bhagavan was a man who lived His life helping to awaken “others” and who lived without any need of privacy or control over others. Bhagavan’s teachings also contained what I had been missing in my previous practice: the enquiry “Who is the one having this experience?” When I had experienced a sense of void previously, I could have asked “Who is experiencing a void?” This would have solved all of the problems I had. However, Bhagavan and self-enquiry only slowly became central in my life over several years of peaking and losing interest in Ramana and Buddhism. About a year ago, after some recent mental difficulties, I opened my heart to Bhagavan and His teachings. Now he is of central importance to my life, and I try to do self-enquiry every moment that I remember to. Last Summer, I started to interact on internet sites devoted to Bhagavan. For the first time in my life, I have nourishing relationships with siblings in Bhagavan which brings me here. This Summer I intend to visit Arunachala and Bhagavan’s samadhi, even though I know that the Real Bhagavan is always in my Heart, or rather is my Heart. “He that has earned the Grace of the Guru shall undoubtedly be saved and never forsaken, just as the prey that has fallen into the tiger’s jaws will never be allowed to escape.” ~ From ‘Who Am I?’ by Bhagavan Sri Ramana Maharshi. He has “me” in His jaws. I will never again try to escape. 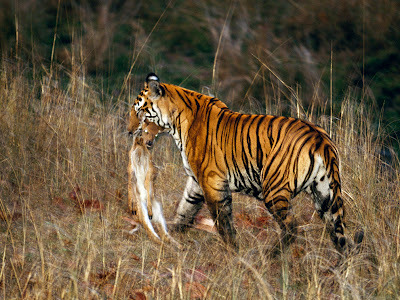 Of course the ego-body sacrificed to the Devine tiger is none other than the tiger itself. Bhagwan is Self. Bhagwan is Guru. And I have never felt the need to seek an external Guru. Thank you Evan for sharing a part of your spiritual journey. It is fascinating and also inspirational to see how sincere devotees find their way to Bhagavan Ramana. Thanks Dr. Keith for sharing your journey. I regularly benefit from your postings in Facebook. Gratitude from a fellow devotee. My eyes fell on the cover of a book decades ago when I was very young and seeking guidance and I saw a luminous countenance I never forgot…it took me decades to find that face again – that of Ramana Maharshi – and, like the author of this post, I too do not need to look elsewhere again. It is said that the genuine seeker of truth falls into the jaws of the Tiger of Liberation – and once this happens, He will never let us go…read on. Thank you for a wonderful share, Dr. Evan Keith and Harsh Luthar! Bhagavan’s LOVE and GRACE is pouring on us ALWAYS ..